Halite is also known as rock salt. The chemical name is sodium chloride NaCl It is called an evaporate. It forms in places where sea water has been isolated from the ocean forming a lake. As the saltwater evaporates in the lake the salt becomes concentrated in the remaining water. As the water continues to evaporate the lake can no longer hold the same amount of salt. The salt precipitates out and is deposited as crystallized sodium chloride or salt. There are two areas in the United States where rock salt is currently being deposited, The Great Salt Lake in Utah and Searles Lake in California. The Great Salt Lake is the remains of a vast inland sea that has left salt deposits over much of North West Utah. There are many places on earth where salt water lakes have been deposited in the past. Some of these deposits can be 400 meters thick! Some of these underground deposits are being mined for salt. 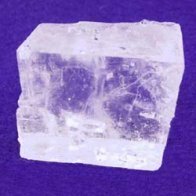 Halite normally forms perfect cubes, look at ordinary table salt with a magnifying glass. Rock salt can be clear or have a pink cast to it. The pink color comes from bacterial debris that has been trapped in the salt crystals. The easy way to identify sodium chloride is by taste. First lick your finger, then touch the mineral in question, finally taste your finger. If it tastes salty it is halite. Never lick a specimen for the taste test! There are poisonous minerals that resemble halite. By using your finger you can keep yourself safe. Halite has many uses. We get our table salt from it. In cold climates salt is used to control ice on roads and sidewalks. It is used to soften water and as an ore for sodium and chlorine.